Regardless of how you feel about Stephen Colbert's return to latenight, there's no denying his first week of musical guests have been nothing short of stellar & Tuesday night was the best yet! Run The Jewels performed their 2014 track Angel Duster with TV On The Radio as their backup band! It was so badass! 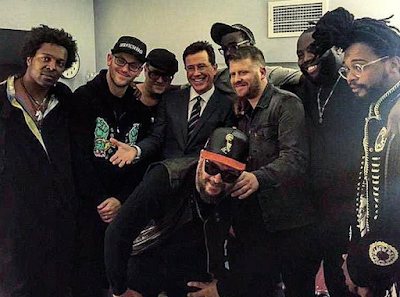 Colbert put it perfectly when he introduced RTJ & TVOTR saying "Tonight's band is so hip their backup band is TV On The Radio."